Senate hopeful Sam Rohrer has signed onto the tax plan of one-time GOP presidential hopeful Herman Cain. The proposal would scrap the current U.S. tax code in favor of a 9 percent corporate tax, a 9 percent personal income tax, and a 9 percent national sales tax. Congressional hopeful Ted Waga (PA-4) also signed onto the plan. Cain surged to the top of the presidential polls in fall 2011, but his campaign came undone amid allegations of sexual harassment from former business associates. The news came on top of accusations that Cain’s speeches contained lyrics from the Pokemon movie. Many of the 18 years Rohrer spent as a state rep. in Harrisburg, the Berks County Republican advocated a sharp change in Pa. tax rules to eliminate the property tax. He’s one of five Republicans vying to unseat Sen. Bob Casey. Waga is a sergeant in the Baltimore County police department. He’s running to replace retiring Rep. Todd Platts. Here’s the full press release, courtesy of the Waga campaign. (Atlanta) Businessman and former presidential frontrunner Herman Cain is proud to have the first two U.S. office-seekers from Pennsylvania formally adopt his ‘9-9-9’ Economic Recovery and Jobs Program. Sam Rohrer is running for U.S. Senate to replace Democrat Bob Casey. Rohrer is joined by Ted Waga, who is looking to fill Pennsylvania’s 4th Congressional District seat, left open when incumbent Todd Platts opted not to seek re-election. Both Republican candidates are drawn to the bold, solution-based ideas behind ‘9-9-9’. Rohrer and Waga bring the number of candidates for federal office in 2012 who have adopted the ‘9-9-9’ Economic Recovery and Jobs Program and pledged to enact it into law to nearly 30. More information about Sam Rohrer and his campaign can be found on his website. More information about Ted Waga and his campaign can be found on his website. Candidate commitments to ‘9-9-9’ are a part of the much broader Cain’s Solutions Revolution. To learn more, including the April 16, 2012 event “Revolution on the Hill”, please visit www.cainconnections.com. I’m getting a little concerned about Sam Rohrer’s associations. 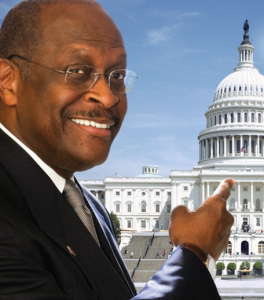 Recently I heard he’s associated with the Koch brothers Americans For Prosperity, now he’s hanging out with bankster shill Herman Cain., What is going on with you, Sam? Did you sell out? Ted and Sam get the real issues. a flat tax is the way to go. Should be 9-9-9-9-9. First year 9% Congressional pay raise and 9% pension raise in 2013. Signing on to a video game tax policy should disqualify him immediately.